It is well-known that changes in temperature on decadal time scales are strongly influenced by natural and internal variations, and should not be confused with a long-term trend (Easterling and Wehner, 2009;Foster and Rahmstorf, 2011). An intensification of the trades has affected surface ocean currents called the subtropical gyres, and these changes have resulted in a predominance of the La Nina state. The La Nina phase is associated with a lower global mean temperature than usual. Balmaseda et al’s results also suggested that a negative phase of the pacific decadal oscillation (PDO) may have made an imprint on the most recent years. In addition, they found that the deep ocean has warmed over the recent years, while the upper 300m of the oceans have ‘stabilised’. The oceans can be compared to a battery that needs to be recharged after going flat. After the powerful 1997-98 El Nino, heat flowed out of the tropical oceans in order to heat the atmosphere (evaporative cooling) and the higher latitudes. The warming resumed after the ‘deflation’, but something happened after 1998: since then, the warming has involved the deep ocean to a much greater extent. A weakening of the Atlantic meridional overturning circulation (MOC) may have played a role in the deep ocean warming. The recent changes in these decade-scale variations appear to have masked the real accumulation of heat on Earth. The new knowledge from this paper, the way I read it, is the revelation of the role of winds for vertical mixing/diffusion of heat in a new analysis of the world oceans. Their results were derived through a set of different experiments testing the sensitivity to various assumptions and choices made for data inclusion and the ocean model assimilation set-up. The analysis involved a brand new ocean analysis (ORAS4; Balmaseda et al., 2013) based on an optimal use of observations, data assimilation, and an ocean model forced with state-of-the-art description of the atmosphere (reanalyses). By running a set of different experiments with the ocean model, including different conditions, such as surface winds and different types of data, they explored which influence the different conditions have on their final conclusion. The finding that the winds play a role for the state of the warming may not be surprising to oceanographers, although it may not necessarily be the first thing a meteorologist may consider. 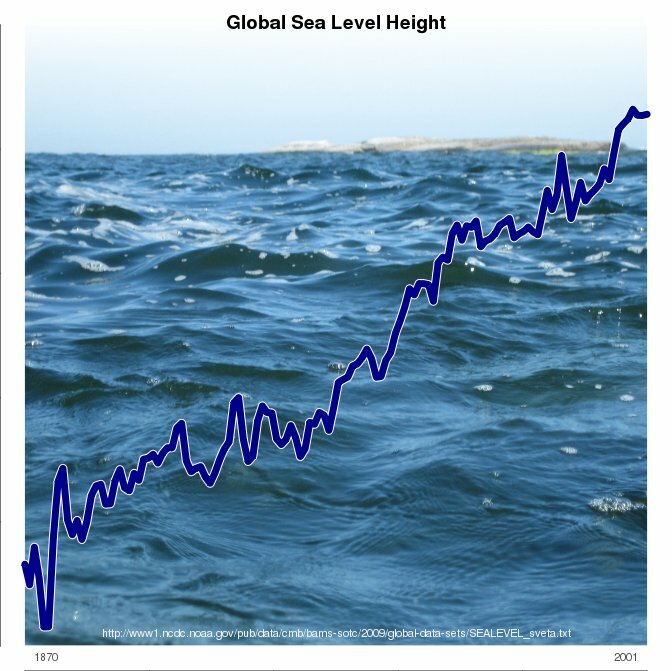 The sea level data you’ve used only goes up to 2001 so doesn’t really tell the story of continued increase over the past decade. Church & White 2011 would be better for a longer view (CSIRO site seems to be down at the moment so I can’t find a link), or satellite altimeter data to track the past couple of decades right up to the present, which is the main period of interest after all. Most assessments of ice sheet contribution to sea level rise indicate an acceleration over the past decade, whereas altimeter-measured SLR has not been faster over the most recent decade (2003-2012) compared to the previous one (1993-2002). This suggests that the relative constancy of SLR is hiding a significant shift in contribution from different sources. In particular, that contribution from land-ice depletion has increased while thermosteric (ocean warming) contribution has decreased in this decade compared to the previous. I doubt this is at odds with the ORAS4 reanalysis, nor with what you’ve written, but thought it worth noting that continued sea level rise does not necessarily mean the sources of that rise are always the same. Should that read, “During the powerful 1997-98….”? I saw The Economist’s piece not as a questioning of sensitivity, but only as a critique of that question. But it did skip lightly over the issue of deep ocean warming, so thanks — many thanks — for picking up where The Economist left off. You’ve added important points about the coupling of atmosphere and ocean. Is it really too much to ask that the Y axis be labelled? As more and more people have pointed out the heat accumulation in the deep ocean, a common argument in the denialosphere has been that the measurements are wrong, because how could heat accumulate in the deep ocean without first passing through the top layer and being detected via ARGO floats and the like (apparently they’re also saying this heat was never noticed near the surface). Could someone please provide me with a response to this claim? Thanks! Could you say something about how the Levitus and Balmaseda series compare? I have the impression that they are quite similar. Is that correct? Indeed, increased energy in the deep ocean is ultimately caused by TOA energy imbalance so must have passed through the upper ocean. The key is that the rate at which heat/energy is “pushed down” into the deep ocean can vary. If you are, for example, looking at the top 300m you’re seeing the result of surface fluxes (energy input/output at the surface) and fluxes between the 300m line and below. Even if you have a constant positive input into the ocean system from surface fluxes, increasing the rate at which energy is “pushed down” to lower levels can quite easily cause measurements in the top 300m to register a flattened trend. I can offer a simple metaphorical example: Think of a bucket held under a running tap and it has a small hole in the bottom. It’s been setup such that the water level in the bucket (our upper ocean) remains the same because the flow input from the tap is of the same magnitude as the output down the hole into the space below the bucket (our deep ocean). Now let’s say we poke out another hole and simultaneously open our tap further to maintain the same bucket water level. We now have an increased flow into our deep ocean but measurement of our upper ocean would reveal no change. This state of affairs is only possible because of the increased flow input to the top of our ocean – if it hadn’t increased the water level in our bucket upper ocean would have decreased. I can imagine changes in ocean currents that cause deeper, colder water to mix with shallow, warmer water, raising the temp of the deeper water and lowering the temp of the shallow water. The shallow water then more readily absorbs heat from the atmosphere, and all this happens at a rate such that the sampling rate of the ARGO floats misses the fluctuations. So I don’t see why the temp has to rise near the surface before it can rise in the deep ocean. Years ago, discussing with an skeptic colleage, I told a joke in connection with this, but difficult to put it in English … Seas are most reasonable place for thermal energy to “hide”. Otherwise, temperatures would further increase and then more energy would go back to space. Modern technology confirms the “logic” of Nature. Anybody cares to explain what are the time boundaries used for the 1.9, 2, 1.6, …°C temperature increases discussed in the Economist or Skeptical Science links? Is it between 2000 and 2050, between (variable) now and 2100, or any other dates? All these authors seem to assume that all readers know what these dates are and never care to mention them. I am sure this is standard knowledge, but it is not a reason not to mention it. I don’t even know if all the different studies and models are using the same time frame. I wonder if testing their “little grey cells” would be useful by asking these clever chappies “If average surface temperatures are close to 14ºC and the earth’s core has a temperature in excess of 5,000ºC, how is it that the deep oceans remain so dreadfully cold?” It just might get their thinking unstuck from the “If it’s hotter there, it’s got to have been hotter here!” nonsense. The oceans are thermally a dynamic system with salinity also a major variable. So why should the deep only warm as a result of the shallows becoming excessively warmer first? Do they actually need to warm at all to allow a net downward energy flux? The problem with focusing on one data set to makes or refute a case like surface temperature is the planet is more complex than that. That the total energy of the system is increasing manifests in various ways including record Arctic ice melt over the last season. So if surface warming seems to have slowed, the extra energy has to have gone somewhere else – otherwise why the record Arctic sea ice low? Measuring climate sensitivity as a surface temperature delta has to be understood as a long-term equilibrium result not a short-term outcome. Possibly this is a detail we need to communicate more clearly. As all this is going on the solar cycle is still unusually low, even as it’s supposed to be peaking. If I remember my ocean circulation correctly, the exchange between the deep ocean and the surface/shallow ocean takes place at only a few regions. What is more, the water there would not be particularly warm, so it is quite possible for it to warm the deep oceans while having little influence on the intermediate regions. Tom Scharf @ 5, is this you? LH @ 6, stay away from those nutblogs! Unless you want to become like them. It’s nutty to look at a large dynamic system and argue that heat moves only by conduction. Convection is what moves heat around on earth and in your body. Except when large masses of air or water on earth are moved to a region with a different temperature, the word advection is used. Think advection. Now think vertical as well as horizontal. Sometimes descending air over the Arctic causes high pressure there and cold blasts over large parts of the northern hemisphere. Warm air must be moving upward somewhere. One place may be near the equator, where there is an upward current anyway. Back to the sea. La Niña is a time of strong trade winds, upwelling of cold water along the pacific coast of South America, and good fishing. Blowing across a fetch of thousands of miles, the trade winds actually move water westward. As this surface current crosses the Pacific it warms and produces rain. Much rain may fall back on the same surface current a ways ahead, but some gets away, leaving saltier water behind. At the western side, sea level becomes higher as the blown water builds up. At the same time much rain gets away from this water, making it saltier until it sinks despite being warmer. Ray – for a long time it was thought he thermohaline circulation was the only way the ocean interior was able to be ventilated, but the oceanographic community has realized that wind-driven mixing plays a very large part in this process. It is notable that the deep ocean warming is occurring in regions where the wind-driven surface ocean currents converge – the edge of ocean gyres. Where these currents collide, the water has no place to go but down – taking heat and air with it. Speed up the winds at certain latitudes and the stronger surface currents and convergence therefore lead to stronger downwelling. So yes, this deep ocean warming is only confined to specific areas of the ocean so far. There was a very interesting paper published last year (or early this year) which revealed the formation of powerful eddies (whirlpool-like structures) in the Southern Ocean in areas of strong convergence. See if I can track down the paper. We can see the heat change in the different layers of ocean. I differenced the Balmaseda grafs, it shows 0-300,300-700m warmed from 2000-2006 and 2006-2010 sees 700-2000m warming. This is a blow-up of the changes in the heat content of the top 300 meters and then from 300 to 700 meters. The heat contentof the lower, colder body of water is proposed to have been heated by the upper level, even though the heat increase in the lower level is greater than the top. For anyone with academic access, some early work by famous names may be accessible. What did they think 60 years ago about the rate of deep ocean circulation, was anything said about what they thought on temperature changes in the abyss? > Ray – for a long time it was thought he thermohaline circulation was the only way the ocean interior was able to be ventilated, but the oceanographic community has realized that wind-driven mixing plays a very large part in this process. I heard that but it was long ago. Has it not been understood for quite some time now that tidal energy makes a big contribution to keeping the major “thermohaline” circulation going? Doc Martyn – an argument from incredulity no doubt passes as rational assessment on the contrarian blogs, but this is a blog run by climate scientists. I sense a lot of mole-whacking in your future if that’s the best you can come up with. In areas of strong convergence, and therefore downwelling, it is unlikely that a strengthened circulation will allow heat to disperse horizontally. The most likely destination is further downwards – as the observations attest. Furthermore, the Earth’s ancient history reveals that the equator-to-pole, and surface-to-deep-ocean, temperatures gradients were greatly reduced when compared to modern-day. This implies that future ocean warming may likewise see greater warming rates (at some point), in the deep ocean and higher latitudes, than the equatorial regions. How this may progress is unknown. And lastly, you need to appreciate that the oceans are not a passive receptor of global warming. Warming the ocean leads to changes in atmospheric circulation, and the existing heat distributed in the ocean, which changes the wind-driven ocean circulation. The simplified ocean model examined in Xie & Vallis (2011) might provide some enlightenment for you. and from there cold water sinks to the bottom, then flows away along the bottom. The water surface away from our simulated pole receives heat from the room by conduction from above. The system has reached equilibrium, the heat conducted down from the warmer surface exactly cancels out the cold advected along the bottom. Now reduce the rate of cooling, and the advection slows. The model is no longer in equilibrium, and is gaining heat, but the surface temperature (away from the cold source) has not changed. The Red Sox are up four games on the Yankees even though they’ve only played three games together and the Red Sox only won two of those. How can this be? They play in a league and not just a rivalry. If you want full continuity you have to look at the whole situation. Similarly, you are asking a sieve to act as a bucket in your comment. You need to look at energy fluxes out the bottom as well as between the layers and in from the top. You can rest assured though that the top will usually be warmer than the bottom since colder water is denser. And, no matter how things mix, you won’t get colder reservoirs heating warmer ones. The layers can change energy content at different rates for a while without getting a thermal inversion. The only thing that comes close to 17 years is the current 13 year solar cycle and the sun is a million times larger and more significant that anything on this planet. There was a paper published within the last couple of years by some of this sites contributors that suggested part of the disparity may be due to an increase in land based water. By the way: I think I correctly guessed the cause of the situation of their April/May maxima, but “miss” other maxima app. in October. Any explaining help? Thanks. As I said, my understanding of ocean circulation dates from long ago (mid ’90s), when I edited an article on the subject for Physics Today. It seems to me that it ought to be obvious that little mixing occurs between the mid depths and the deep ocean, since the deep ocean is so much saltier–but then reasoning isn’t a strong point over at WTFUWT. Both wind and tides lift the deep water up to the surface. This water must be replaced by dense waters made in the high latitudes. There are two major areas for formation–Greenland-Iceland-Norwegian sea, and around the Antarctic. The current thought as to how the deep ocean is warming is because formation of the coldest bottom water around the Antarctic is slowing down, being replaced by ‘warm’ water from the North Atlantic. The net flow of LW and latent heat is always from ocean to atmosphere and then to space when averaged across the planet, and the oceans receive the vast amount of their energy from SW solar. When we say the oceans are accumulating energy, unless their has been some large increase in SW output from the sun, the only thermodynamically possible way that the oceans can be gaining energy is for the flow from ocean to atmosphere to have slowed. Looking at it from this perspective it would be quite thermodynamically supportable to see how the deeper oceans are storing even more as the entire flow is backing up from shallow to deeper oceans. Accumulating GW gases in the atmosphere alter the thermal gradient between ocean and space, so energy flows less readily from ocean to atmosphere to space, and just like wearing a jacket on a cold day does not force more energy into your body, but rather allows the body to retain more energy. The only difference is that the body gets heat from metabolism and the oceans get warmed mainly from SW solar. Eric: Many thanks. I agree with you, but the “curves” are all almost exactly equal. As they correspond to periods 5 years delayed from each other, with 25 common y., diferences show unusually regular changes from a 5 year period to another 25-30 y. later … Where are the chaothic properties of of the system that many skeptics argue make impossible any warming (or cooling) “forecasting”? 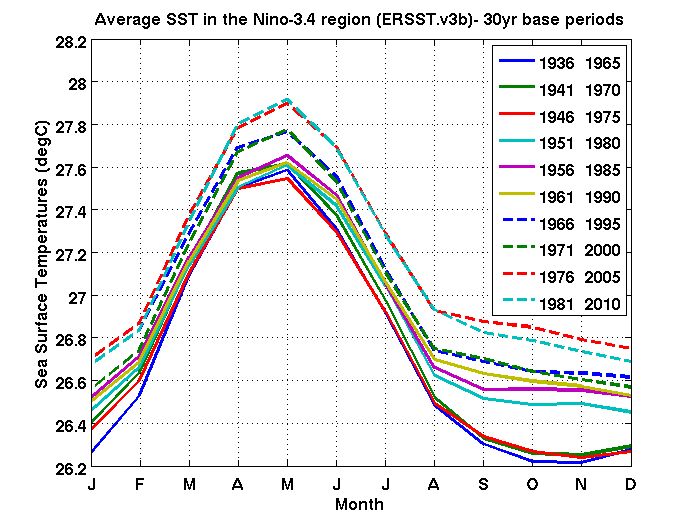 Even they differences due to the “Niño/Niña” changes themselves are swept by the regular warming trend! Any comment relative to the yearly maxima app. 40 days after March equinox, but not after September one? I learnt at school that heat transfers to other bodies by conduction. Convection was the means of moving the body which is holding the heat. Am I correct or do I need to go talk to my teacher? Glad to see a bit more focus on heat content as a measure of change to our climate system. I think that pointing to ocean heat content is the best response that can be made to anyone who thinks warming has stalled – surface air temperatures are not the definitive measure of climate change and I’d like to see the habit of treating it like it is replaced by reference to more fundamental measures of change like heat content of oceans (plus land, ice and atmosphere). 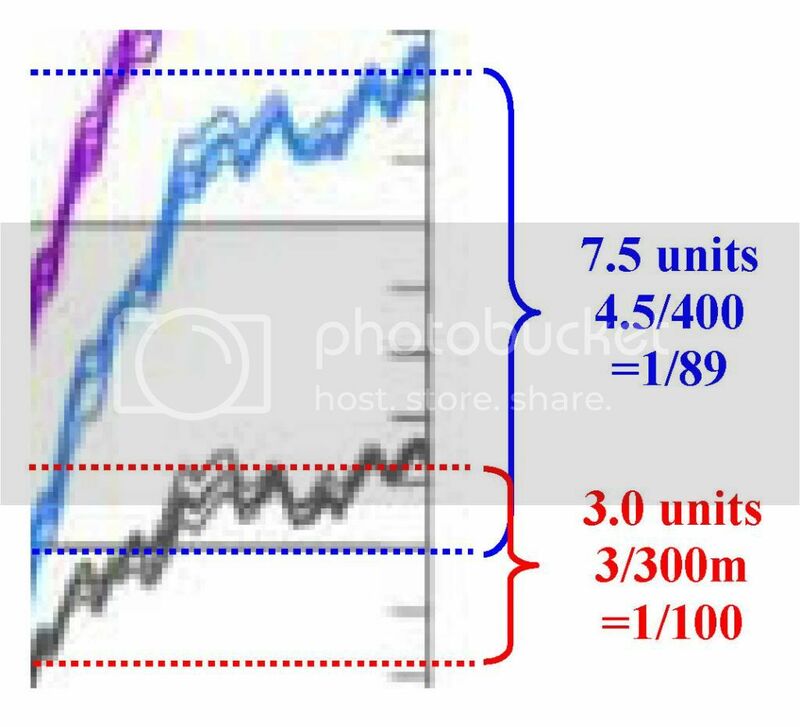 What would the “no statistically significant warming for ‘x’ years” test, currently so popular and misleading (popular because it’s misleading) when applied to surface air temperatures, yield for ‘x’ if applied to ocean heat content or combined ocean, land, ice and atmosphere? A statistics ignoramus like myself would guess less than 5. Conduction, convection and radiation are all methods of heat transfer. Radiation transfers heat by transferring energetic particles (usually photons). Conduction transfers heat via direct contact between heat reservoirs of different temperature. Convection transfers heat by transfer of mass between bodies. So, yes, you need to talk to your teacher. Tim Jones – since 2006/2007 the level of light-blocking sulfate pollution appears to have decreased. This is attributed to stricter emission standards, and the use of “scrubbing” technology in China that removes more of the sulfate waste from smokestacks. See Figure 1 in Klimont (2013). Titus @ 35, your teacher may have been thinking of solid bodies, not fluids that just mix. And radiant heat was sort of forgotten. Pete Dunkelberg explained how heat is transported in the oceans, and there is conduction and convection. Some skeptics argue that for upper layer warming to cause deep layer warming, intermediate layer warming must occur first. (The skeptic may inchoately assume, correctly but irrelevantly, that for the heat flow down some static vertical column to increase, the gradient must increase throughout.) Pete Dunkelberg correctly points out that the skeptics seem to overlook convection (or advection). You point out that heat indeed only is exchanged between bodies through conduction (radiation or latent heat isn’t relevant, here, of course) and that convection merely is a matter of moving heat-containing ‘bodies’ around. This may be true, albeit somewhat pedantic, but it would only help the skeptics if they were arguing that the ‘upper layer body’ can’t warn the ‘deep layer body’ even in the presence of convection because what really happens in that case is that upper and deeper layer ‘bodies’ merely trade place without exchanging heat in between them. But now we seem to have moved from pedantry to sophistry. Eric@Response@37 is saying that the continuing rise in Ocean Heat Content infers a continuing global energy imbalance. This is in conflict with the supposition @37 that the recent lack of surface warming is due to increased Chinese emissions reducing that global energy imbalance. And Rob Painting @39 is linking to a paper that concludes there was a reduction in the sulphate “emissions” both globally and from China since 2006. In my understanding, the gross level of emissions is not immediately equivalent to the effect the emissions have on climate in that the impact of those sulphate emissions is affected by the latitude of their release. That is Chinese & Indian emissions have greater impact being released at lower latitudes. Klimont et al 2012 Figure One shows the increases in Indian emissions matching the decreases in China’s since 2006, these two being globally the bulk of the low latitude emissions. I also note in that Figure One – International Shipping (which would have a significant element of low latitude emissions) has doubled over 20 years, a rate of increase about half that of China’s recent decline. heat is not temperature. The ARGO floats measure temperature. There are many ways to move heat from A to B, and not all of them involve temperature differences (though some do). Radiation is likend to a hose pipe directly streaming water on the flames. Conduction is likened to folks passing a bucket of water hand to hand and then the last person tipping the water on the flames. Convection is likened to one person running with the bucket fom the source to tipping it onto the flames. I obviously missinterpretted what was going on here so my teacher was correct after all. Don’t forget about advection. The advection of warmer air and warmer water plays a big role in Earth’s climate. While it is traditional to lump it with convection, advection gets the notion of horizontal transport much more specifically. I realize climate skeptics remain, but it’s my impression that they numbered with those who refuse to accept evolution and want to return to the gold standard to fix our economies. If I’m wrong about this will these complex discussions of climate science be convincing? The scientific report is very interesting in itself and I appreciate the more detailed explanations of its content detailed in this blog. As for the reference to the Economist magazine I quit my subscription long ago as their analyses trended to more and more follow the line of thinking that crafted the spectacularly unsuccessful responses to the financial crisis that US FIRE sector instigated. The problem I have personally with global warming science isn’t a lack of belief that it’s occuring — the evidence is in and it’s hardly a matter of faith — but my lack of understanding what it’s full implications might be. Further, knowing that a catastrophe looms sometime in the future little helps me plan how to respond personnally and even less helps me determine what actions we must take collectively to mitigate the future harms. I apologize if I’m drifting off-topic. My interest in this website and blog series is not just to better understand climate science but to understand its implications for policy. It’s bad enough that the powers controlling our polity seem determined to carry on with their rapine no matter what. I’m left with the knowledge that we’re heading toward disaster, possibly sooner than we want to think, yet I have no good idea what policies to get behind in the unlikely event that some new force wrests power from the vested interests working so hard to promote and exploit the disaster. General suggestions like “Stop burning coal and oil” hardly provide a full answer. I have the impression that a partial import of this suggestion is that we all must stop driving cars; put our air conditioner thermostats at 95F, and heating to 60F; build up limited mass transit and otherwise limit the transport of goods and services between locales … . It will take more than convincing science to achieve these kinds of change and it will take much stronger arguments than the convoluted arguments used to reach the equivocated conclusions climate science promotes. With the ice melting at both ends of our world isn’t it time to throw off some of this reticence to suggest and promote some clear policies and plainly state the consequences of not acting? #48 Jeremy Grimm–I too follow RC as a non-scientist intensely interested in figuring out likely outcomes and realistic personal and political (policy) responses. I suggest that you will get good science here, but this is not a place for in depth consideration of policy issues. Science is not policy nor vica versa; leave that conflation to the denier crowd. Widespread production of hydrogen sulfide.